2 of 4 2 teaspoons cocoa powder and 1/2 teaspoon cinnamon to flour mixture. Continue as directed. Halve dough and form into 2 disks. Refrigerate 4 hours. 3 of 4 On lightly floured work surface, roll out one disk to 1/4-inch thickness. 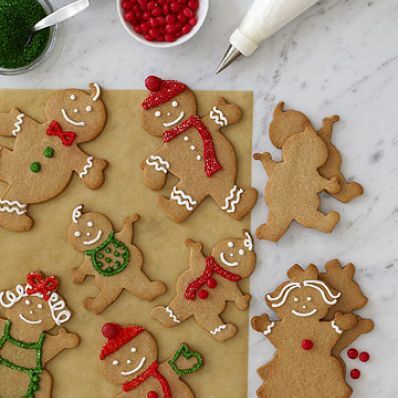 Using a large gingerbread cookie cutter, cut out 2 figures. Place on ungreased baking sheet. Repeat with a small cookie cutter and other half of dough. Gather scraps and refrigerate. Reroll to form total of 2 large and 14 small cookies. 4 of 4 Bake at 350 degrees F for 14 minutes. Make Royal Icing. Decorate with Royal Icing, candy and sugars as desired. 1 of 1 Find Basic Sugar Cookie Dough and Royal Icing recipes by browsing our recipe collection in the search bar above. Per Serving: 1 g fiber, 65 mg sodium, 298 kcal cal., 50 mg chol., 7 g sat. fat, 47 g carb., 11 g Fat, total, 4 g pro.